It started fairly slow, but by the end of the night there was no doubt that Wilsonville was the better team in its first clash with the Rex Putnam Kingsmen on Friday, Jan. 25. After a 7-5 scoreboard at the end of the first quarter, Wilsonville came alive in the remaining 24 minutes to win 69-44. After yet another successful outing, Wilsonville increases its win streak to 11 and is now 6-0 in the Northwest Oregon Conference (NWOC). Putnam meanwhile falls to 2-4 in the NWOC, 11-6 overall, after beginning its season 9-2. Wilsonville and Putnam put together a tepid first quarter. Each team only got a handful of buckets from the field and supplemented the scoring with points from the charity stripe. After eight minutes, Wilsonville held a slim 7-5 lead. In the second quarter, Wilsonville came alive. The Wildcats put together a 10-2 run on the backs of baskets from senior Teagan McNamee and sophomore Emilia Bishop. Both members of the Wildcats squad factored into the team's success over the rest of the game. Bishop notched 10 points in the first half alone, and McNamee had 12 points in the game total. Putnam went basket for basket with Wilsonville in the middle of the second quarter. 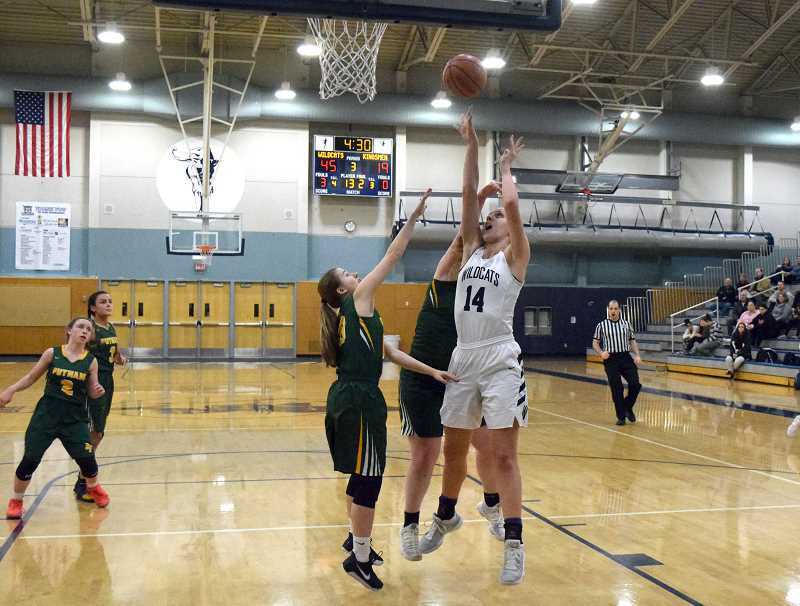 Junior Sarah Rope and senior Emma Whittington recorded two baskets during that time, but Wilsonville took the control of the contest right back. Senior Hannah McKinney scored four points, and senior Cydney Gutridge scored a basket from range. By the end of the half, Wilsonville led 31-15. Coming out of the locker room at half time, the Wildcats continued to play fast and loose in transition. 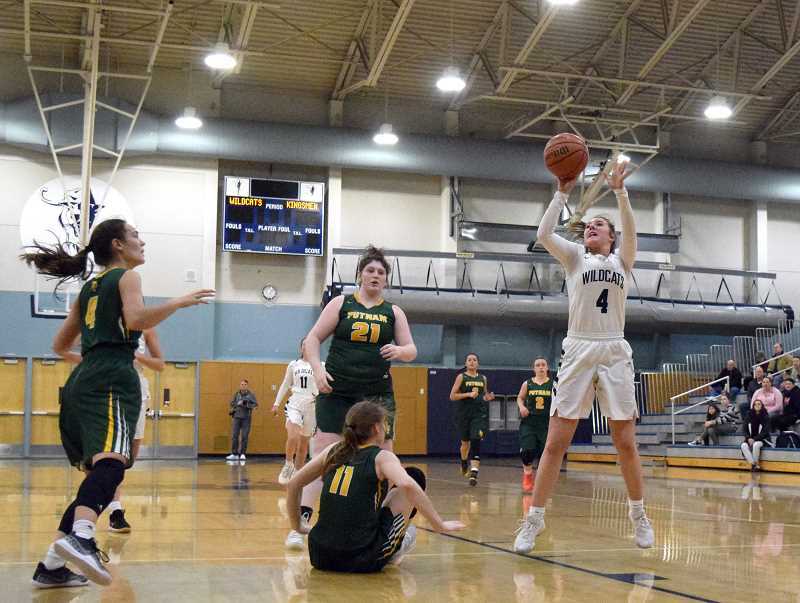 Wilsonville picked up eight straight points, including a pair of baskets from Bishop and one from McNamee. The duo combined for the final basket in that run with McNamee driving into the paint and dishing the ball off to Bishop for the go-ahead layup. 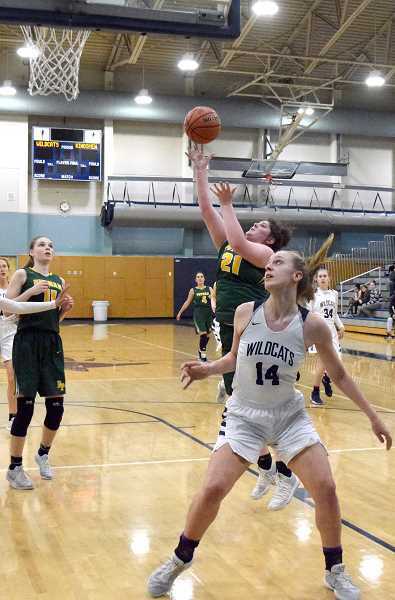 Rex Putnam's Sarah Rope got a basket to stop the streak, but Wilsonville picked up right where they left off. McNamee scored three straight baskets in the paint, and Bishop scored her third basket of the quarter. The 6 foot, 2 inch sophomore scored 16 points in the game. Midway through the third quarter Wilsonville led 47-19. Putnam put together a small run of its own with eight points. Rope, Whittington, and junior Miranda Evans each combined for the total. Wilsonville ended the third quarter with a pair of baskets from McKinney. The lead for the Wildcats was now 54-29. In the fourth quarter the Wildcats continued the full court attack. Sophomore Sydney Burns began the quarter by drawing the foul and dropping a pair of free throws. Junior Kayla Hieb made her second basket of the night, and the lead stood at 58-30. Putnam slowly ate into the lead with repeated trips to the free throw line. For the remainder of the game, the Kingsmen were 5-of-6 from the charity stripe. But it was not enough, and Wilsonville ended up with the win 69-44. Wilsonville (13-4) will square off with Parkrose (0-5 in NWOC, 5-10 overall) on Tuesday, Jan. 29. 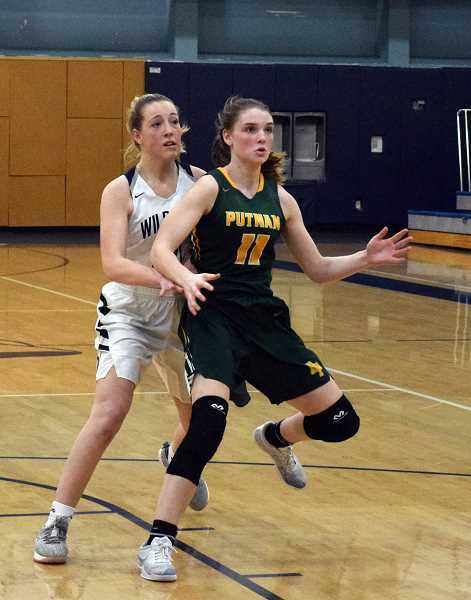 Putnam (11-6) will face off with Scappoose (0-5 in NWOC, 1-13 overall) in the duos first league meeting on the same day.